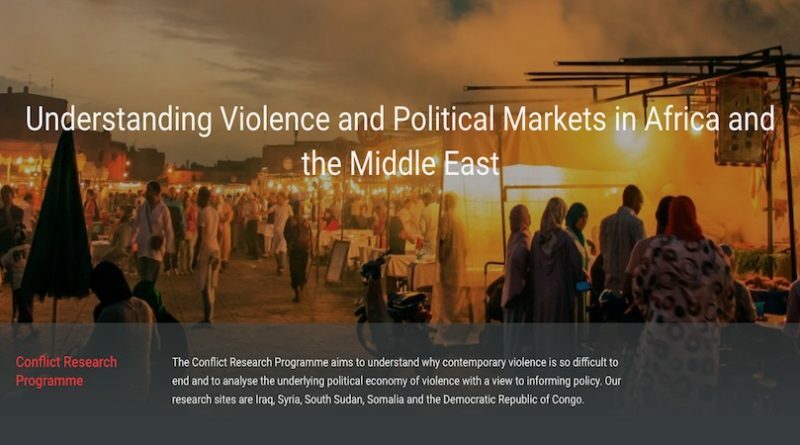 The Conflict Research Programme (CRP) is an international consortium of researchers and academics working in partnership to deliver findings from across a wide range of research sites, including the World Peace Foundation. Alex de Waal, WPF Executive Director, is a co-director for research with the CRP. Other institutions include: the London School of Economics, Social Science Research Council, Conflict Research Group at Ghent University, Institute of Regional and International Studies at American University of Iraq (Sulaimani), and Peace Direct. It focuses on Iraq, Syria, DRC, Somalia and South Sudan, as well as the wider Horn of Africa/Red Sea and Arabian Gulf/Middle East regions. It take a comparative politics approach to analysing the specifics of these locations, whilst also elaborating on local political idioms to better understand the complex economic and social underpinnings of politics and conflict that help explain the frustrations of state-building. The CRP is an international research consortium led by the LSE that holds a £6.68m grant from the UK Department of International Development. Following the successful completion of an inception phase, the programme is currently funded from October 2017 to March 2021. Access synthesis papers, occasional papers, and other outputs from this grant. ← Pax Africana or Middle East Security Alliance in the Horn of Africa and the Red Sea?